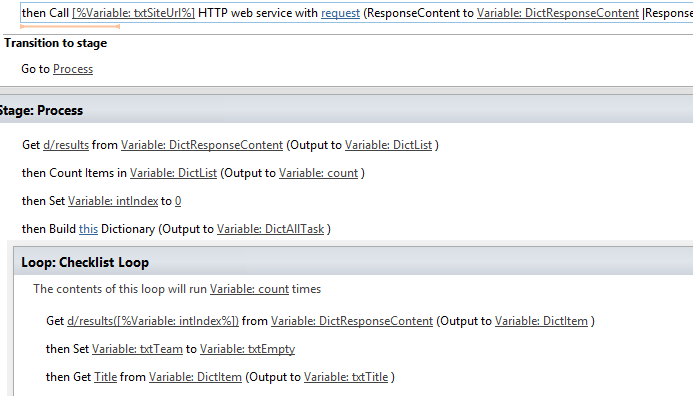 I am getting list items using Web Service action in SPD 2013 workflow. Then looping through these items I am setting workflow variables like Title, State. For example: value in Title variable are "123", "456","789" and State are "Done","Pending", "Done". If anyone has done this or can point me in right direction, as when I try to build it as string it throws error and then I tried to add these as a dictionary containing a dictionary but not able to add items in dictionary in loop dynamically. Below is screenshot of Web Call and loop. If you want to set multiple line of text field with JSON results from REST API in designer workflow, we can get the JSON results from response content and output to a dictionary, then set the field with this dictionary.